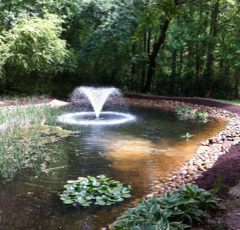 Water Feature Contractor in Buford, Ga providing water feature design and water feature installations. Can you hear it? There is nothing more relaxing than the sound of water moving over rocks and spilling into a pool below. They say that water calms the spirit and provides ultimate relaxation. 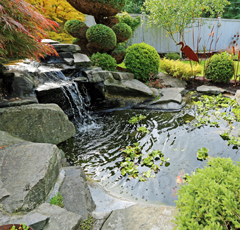 Every water feature that we install is custom to your property and your desires. What Stonescapes Inc provides is individual needs assessments to really determine what you envision your home looking and feeling like. Our expertise along with your wants and needs will produce something that everyone is talking about. 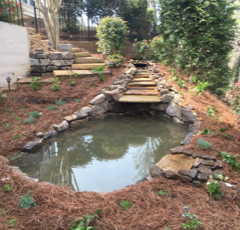 Our creativity and dedication to excellence has helped us become one of Gwinnett’s landscape installation experts! 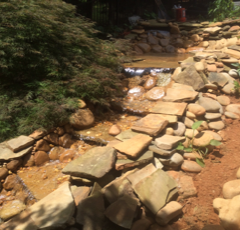 At Stonescapes Inc, we offer quality landscape and hardscape design and installation services to the surrounding areas of Buford, GA. From retaining walls to water fountains, we can assist you with all your landscaping needs. Owner and operator Christian Blackburn,oversees each project site to ensure the highest degree of quality service is delivered. With over 18 years of experience within the landscaping industry, our locally owned and operated business is sure to provide you with quality, reliable service at a competitive price. Our company may utilize the use of sub-contractors. Information and references upon request.